It was not long ago I was moaning about rally games, yes Dirt 2 was great fun, but it didn’t feel like a real rally game. 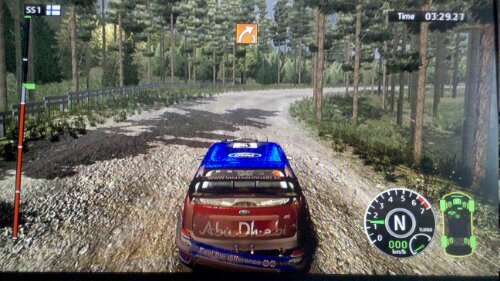 Yesterday WRC FIA 2010 demo showed up on Xbox Live (where is the promised PC demo?) and now the first thing I’m doing is moaning again. Yes it’s a real rally game, taking me back to the old days of long rides through paper tree countrysides, but all I can think about at first is how bad the menu system is. It feels like a menu from a Playstation 1 game, so basic, so bland and so boring. Maybe it’s Dirt 2’s fault for full 3D swanky menu’s. But the first impression is awful. The menu is seriously dated, and jumping into your first race you fear the worst, psychologically you are expecting a crap game. If you can get past this expectation, and even ignore the ageing engine, this is actually a good rally game. I didn’t see a single sole out on the course with me, which is EXACTLY what you want in a rally game, and I certainly didn’t hear Ken Block and chums screaming about how cool they are and what are the latest DC shoes you should be buying. This is a REAL rally game, with realistic damage modeling, so if you smack into a wall on the left (which I just did) expect to lose the front left suspension, duh? Still I should stop moaning, after all this is what I said I was waiting for right? A real rally game, there is no pleasing some people, especially gamers like me, who always find something to complain about. Writing this has left my Ford Focus idle in the middle of the Neste Oil Rally Finland, and my co driver just shouted ‘why are you wasting time’, nice touch. I better listen to him he is usually right.